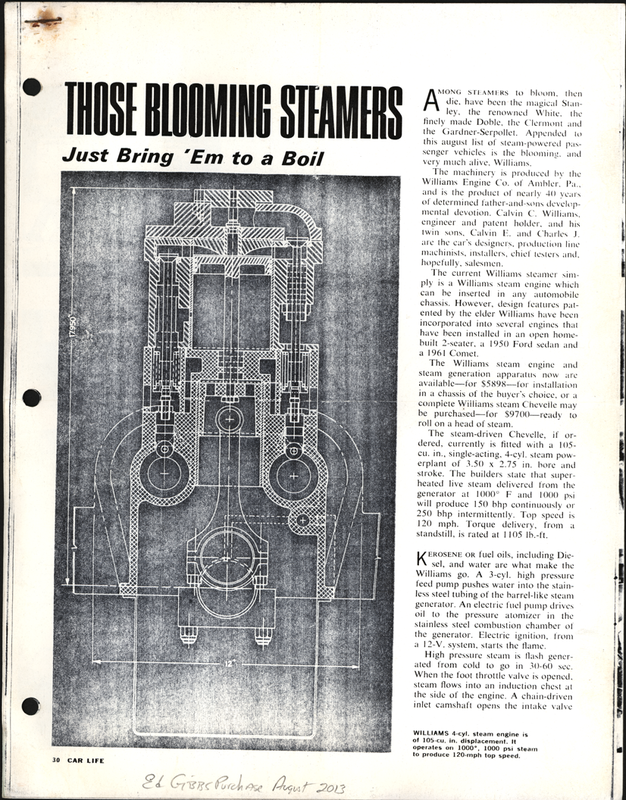 Calvin C. Williams and his twin sons began experimenting with steam cars in 1940, and by 1957 were advertising that they would build complete cars, or convert gasoline autos to steam power. 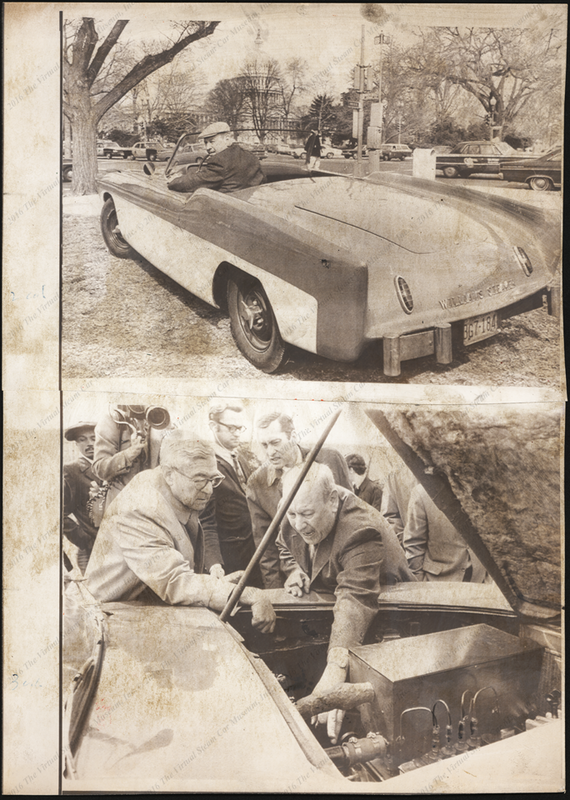 At least one original car was built, using a flash boiler, 4-cylinder single-acting engine, and fiberglass body. In 1966 they were offering a steam converted Chevrolet Chevelle for $10,250, and received orders for nine of these, together with one for a Ford Fairlane from the Ford Motor Company. However difficulties in obtaining small quantities of components at reasonable prices delayed the project, and rather than raise extra capital, the Williams closed their business in late 1968. 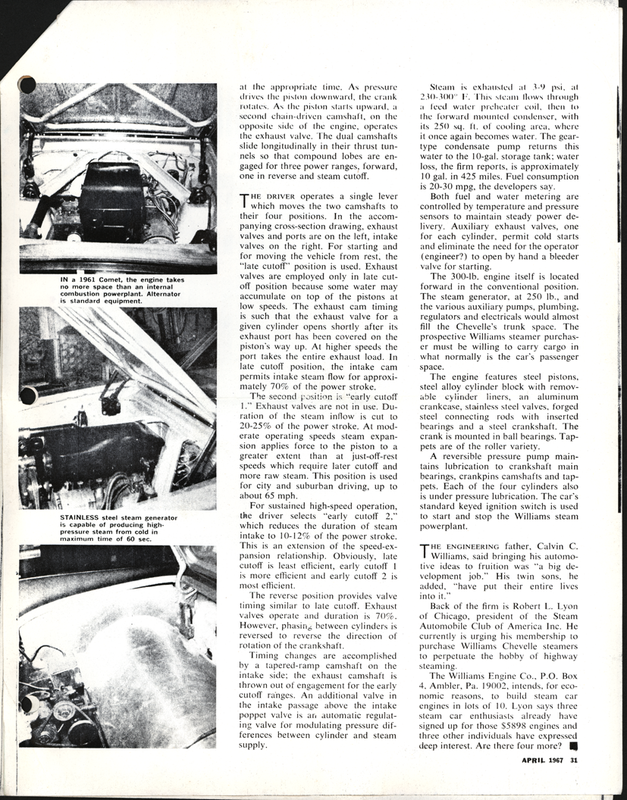 The Williams Engine Company's steam car was featured in this three-page feature in Road Text magazine in October 1967. It shared page space with the Paxton Steam Car. John A. Conde Collection. 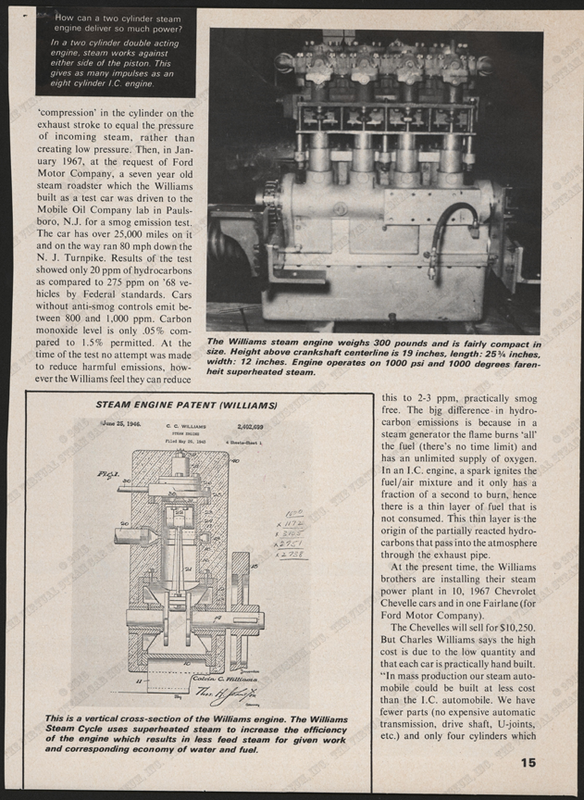 The Washington Post featured the Williams Steamer in this March 26, 1970 article. Representative Leonard Farbstein (D-N.Y.) appears in the photograph. 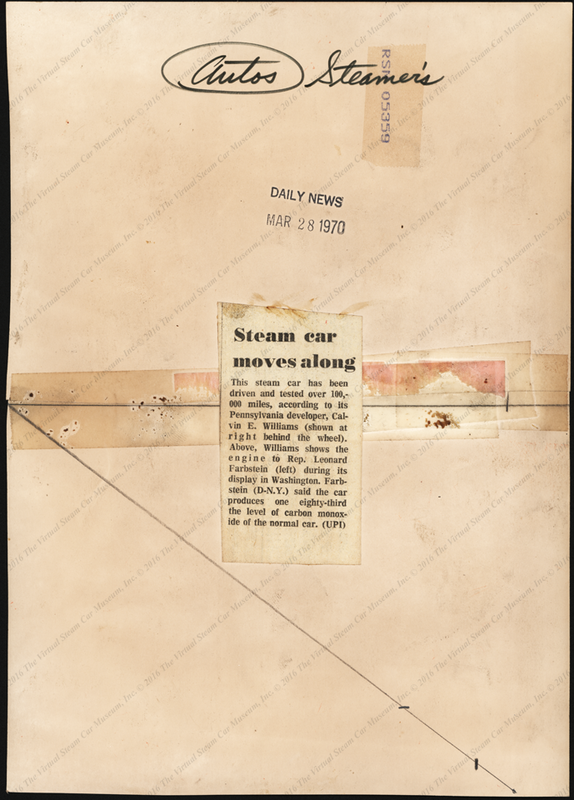 Press photograph of the Williams Steamer, March 28, 1970. 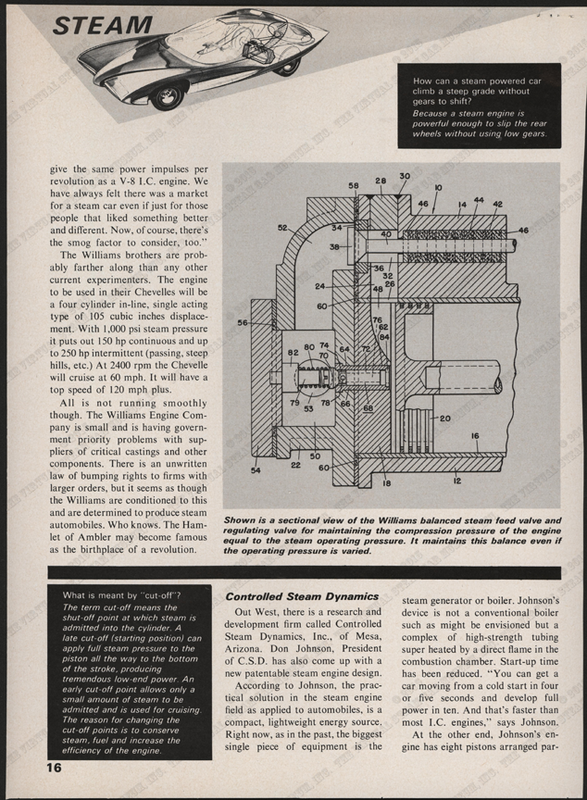 Tad Burgess' feature article on the 1969 Williams Steam Car appeared about 1980. 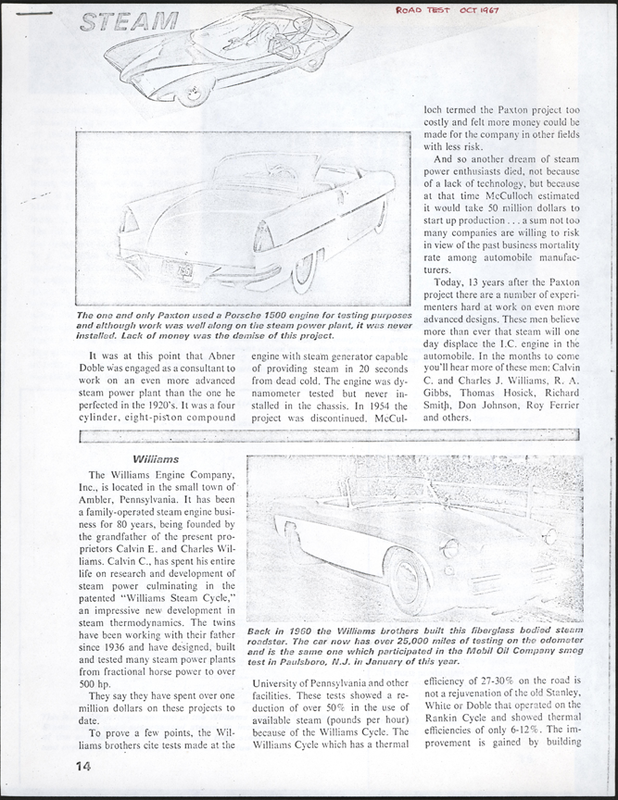 In April 1967, Car Life> magazine carried this short feature on the Williams Engine COmpany of Amber, PA. Edward Gibbs Collection. Georgano, G. N., Encyclopedia of American Automobile, (New York, E. P. Dutton & Co., 1968), p. 207. Contact us if you have additional information about the Williams Engine Company, or if you have questions.